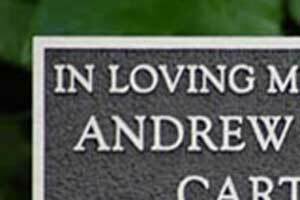 Cast aluminum memorials are a cheaper alternative to bronze, although still with that classic look. We have a great selection of images to choose from and a choice of four background colours. Our aluminum plaques come in several shapes including oval, rectangle and a beautiful heart shape. We also supply tree stakes, holes or rear fixing studs at an additional cost. Aluminum plaques are completely maintenance free.